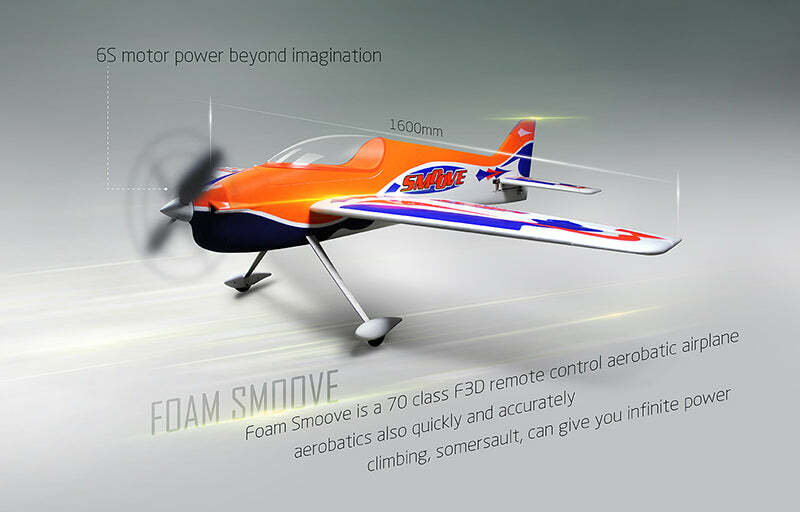 The Dynam Smoove is a 3D airplane constructed of durable EPO foam that will allow you to explore new heights in 3D aerobatics. 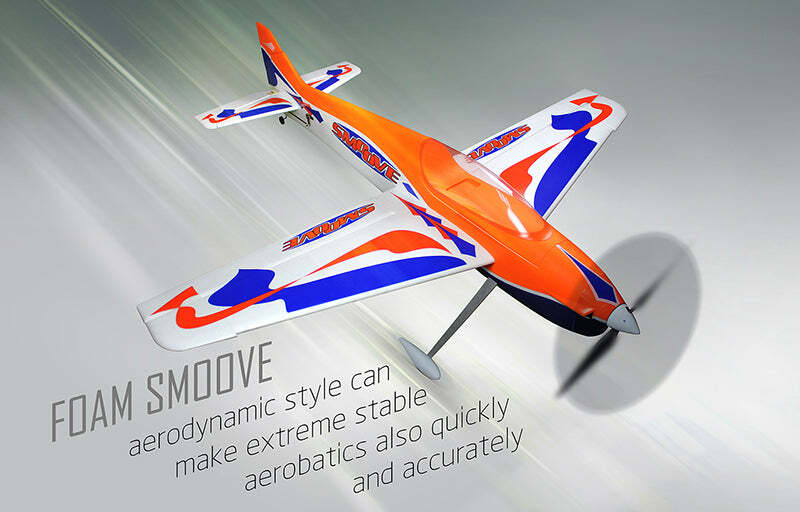 The streamlined outline of the Smoove is tailor-made to reduce drag for more effective 3D maneuvers. With a powerful BM5030A-KV400 Brushless Outrunner motor swinging a 16x12 carbon 2-blade prop, the Smoove is sure to give you all the 3D you can handle and then some! The plane had all kinds of manufacturing problems. However, Motion RC's service has been great!!! It's definitely not a PNP...…………. Where to start! There were so many things just didn't quite fit that it was one hassle after another. The rudder pull pull cables were an inch too short. No adjustment could solve the problem. A friend machined some extensions that worked. The plywood tabs that hold the wings onto the fuse didn't line up, so I had to wallow those out. The landing gear screws cross threaded. The decals spanned the hinge gaps, and had to be cut for the control surfaces to move. The instructions were terrible. The decal page numbers were mislabeled with the placement diagram. The servo arms didn't fit the output shafts, plus there were multiple arms included that didn't fit either. The screws for the cowl were little tiny ones that if lost, you'd never be able to replace them. The instructions said, mount motor to firewall. Well, wrong. The motor had to be attached to a metal motor mount, and then that was mounted to the firewall. So many extraneous screws and bolts came with it, that it was almost impossible to figure out which ones went where. I could keep listing the issues, but I'm tired of typing. Never again! Great with a few issues. Been flying dynam's for 7 years now. Thier price points are what really makes them sell. The Smoove EPO is definitely the "Do Anything" plane. The 70 size Tomcat motor is massive and gives the plane a 1:1 power/weight ratio for infinite climb. Its not excatly a PNP. You have to thread wires, mount servos, mount the motor and revise the CG a whole lot. With a 6s 5000, you have to move it forward all the way to a center spar that's part of the wood frame for it to level out. With a 4000, you have to go just as far or the tail is the only thing flying per say. The manual is practically useless for the rest of build so experience with sizes and threads of screws and linkages is a must. There are 2 sets of nylon M3 screws used for mounting the canopy and the wings. Don't use the set for the wings. They are simply not strong enough to withstand the G's when performing maneuvers. Go to Home Depot or a local hardware store and grab a set of steel M3 x .50 cap screws. No more than a buck for 3-4. The cowl has an 1 inch diameter impression just below the backplate of the spinner. Make sure you cut it out. Use a 1 inch holesaw bit for a flawless factory appearance. This vent hole is crucial or your ESC will be blazing hot no matter how soft or hard your flying it. There will literally be zero venting airflow into the fuselage if you don't make the vent. As with 90 percent of Dynam ESC's, go into program mode or use the Dynam program card and reset everything to factory defaults. Ensure your timing is on "Low" (Throttle Sputter) and your Motor start in on Normal or Soft. Personal experience with this Bolt-On prop shaft setup after 12 flights has shown the prop nut to come loose 50% of the flights. Highly recommend using a few dabs of Thread Loc or getting a locknut to make sure it doesn't come loose. When it does, the grinding noise from the spinner against the shaft is loud and unpleasant and not to mention you will loose total propulsion. The plane includes two high quality Carbon Fiber props. Again, my personal experience showed that both mounting holes were bored out a millimeter to small so they won't go all the way down the prop shaft and touch the spinner backplate for proper mounting. Since it's carbon fiber and not nylon, use a Taper Bit (cone shaped drill bit) to bore the hole just a hair for a good snug fit. Other than that, the plane is great. The Hybrid EPO/Balsa setup is pretty darn cool. It's fast, flies straight as an arrow when trimmed and will perform any 3D maneuver you can throw at it!